Who Lived in Sudentenland After the War? Our project focused on German-Czech relations in the change of time. Especially in the border area between Bavaria and the Czech Republic, these relationships are still partially determined by the Second World War and the subsequent expulsion of the German population from the Czech territory, the isolation of the population caused by the Iron Curtain and negative effects of the EU enlargement. Therefore we deemed it very important to work against the danger of young people perpetuating the fears, reservations, stereotypes and images of earlier generations. 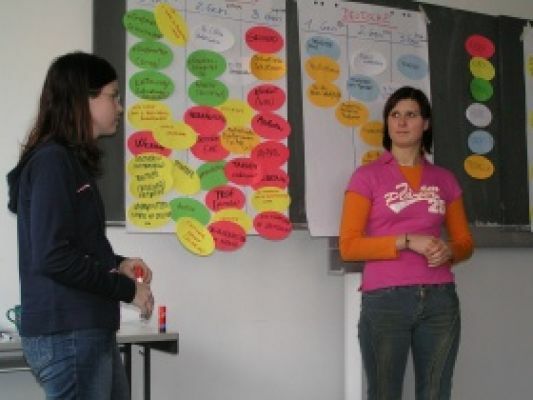 Young German and Czech people were to investigate the history of German-Czech relations in a creative manner, in order to gain new experiences through co-operation which would subsequently disturb persisting images of the "other". The experiences thus gained were to be communicated to the public, which is all too often insufficiently informed. Our project addressed students between the ages of 14 and 18 from the Czech-German border area (10 students per each country). We aimed at this group because at this age, students are still going through an orientation phase. The project aimed at initiating future bi-national co-operation. 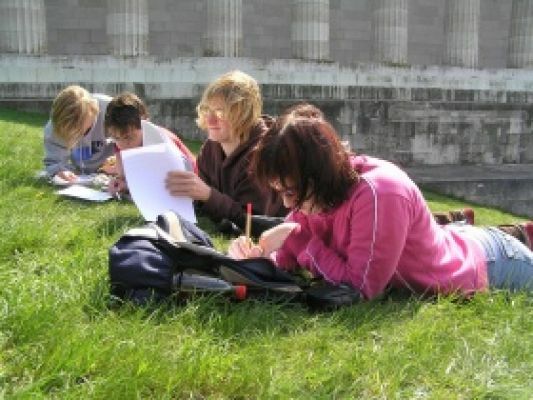 A student exchange, leading to a better personal knowledge of the country and its people, was perceived as the best prevention of hostile attitudes. To this purpose, the students hosted one another in their families. We applied a mixed methodology: there were theoretical inputs in the form of short papers, but the independent group work, discussions and interactive games were of special importance, creating a change from everyday school routine. The students were to attain historical knowledge and journalistic skills and to develop methods to independently carry out and evaluate interviews in their home towns. These methods required a great amount of independent initiative, and the students lived up to these requirements. We addressed Czech and German schools directly to recruit volunteers for the project. Students (with knowledge of German) expressed their motivation in an essay and described the attitude towards Germans/Czechs in a short interview which they conducted themselves. 10 students between 14 and 19 years of age (most of them between 16 and 18) of the J. Š. Baara Gymnazium in Domažlice (Czech Republic) and of the Werner-von-Siemens Gymnasium in Regensburg (Germany) were selected to participate in the project workshop. The seminars and the exhibition were supported by the management and teaching staff of both schools. The project was supported by the Robert-Bosch-Foundation and the Schering-Foundation; its patrons were Dr. Boris Lazar, Ambassador of the Czech Republic in Germany and Dr Michael Libal, Ambassador of the Federal Republic of Germany in the Czech Republic. Besides the regulations governing the law for the protection of the youth, there was the problem that students could not be addressed just like that – everything had to be organised via the school management. It was not easy to find schools with a committed teacher who was willing to support the project by, e.g. supervising the students. This was especially difficult on the German side. On the other hand, it was comparatively easy to find high-ranking patrons and providers of words of greetings for the project. On the spot, we received great support from the teachers involved, who organised boarding and lodging for us and provided their technical skills, e.g. in the production of films. We see it as a success that the students who had applied to participate stayed with the project and supported it actively until its end. Two seminars took place in both countries, each involving a student exchange. The students were accommodated with their host families. Thus, the contact was quickly established. We observed that already on the first day, the German and Czech students formed mixed groups and started communicating in German or English, making appointments for the evening. The seminar started with language animation exercises to break down language barriers. The German students were introduced to the Czech alphabet; language and other barriers were broken down by a number of different games. Pantomime was used to act out everyday life situations; the five most important words needed for each situation were written down on the blackboard in both languages and subsequently memorised. Background knowledge on especially critical phases of German-Czech co-existence and conflicts since 1848 was passed on through papers and presentations and through independent research work. Several phases of special importance for the co-existence of both nations were discussed using sources and texts which were presented to the plenary for additions and discussion. Another focus was on intercultural communication and on the unit "Stereotypes and Prejudice". 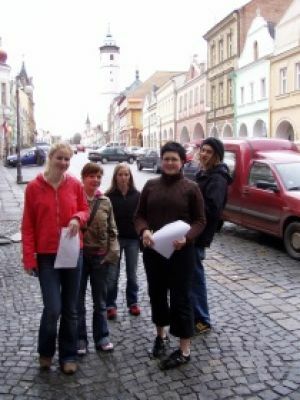 As a practical introduction, mixed groups of students went into the town to conduct short interviews with a Czech and a German each. The questions were, "What are your associations when you hear the words Germany / German / Czech Republic / Czech?" The results were quite surprising. Most people spoke negatively about their own nation, while the "strange neighbours" were judged positively. These statements initiated a group discussion in which the students participated very actively, asking for the reasons behind these results. Similar questions related to stereotypes were asked in the interviews conducted in between the two seminars to be incorporated into the texts. The final focus of the seminar was a practical training on conducting interviews. Through questions, interviews and observations in their personal surroundings the students were to find out how their compatriots saw the strange neighbours. They were to concentrate on the changes occurring within three generations (grandparents, parents, and young people). The experience of perceiving history via the confrontation with individual destinies and opinions of the interviewees was of special importance. At the end of the three-day seminar, each group knew who to interview back home about which topics within the next 10 days before the start of the 2nd seminar. The second seminar was planned already 14 days later to prevent the period of independent student work from becoming too long, as this might have led to a decrease in activities and motivation. During the second seminar, we worked on finalising the exhibition for three days without interruption. 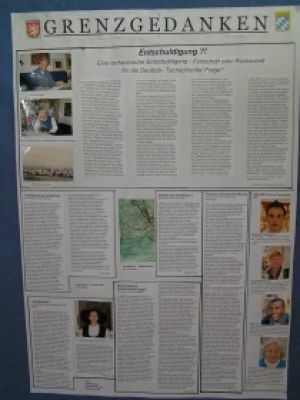 The exhibition was opened on Saturday evening in Regensburg. This intensive work phase was only possible thanks to the extraordinary commitment of the students, which exceeded all expectations, and the strong support provided by the teachers involved. "Who lived in Sudetenland after the War?" "An interview with the mayor of Furth im Wald [Germany]"
"Forgiveness is like being doped with something good"
"How do the Skinheads see it?" "An apology from the Czech side – is it a step forward or backward in the German-Czech question?" The participants wrote the texts in their mother tongue; the texts were subsequently translated or summarised in the other language. The different languages of the participants did not create a problem during the joint work. Interpreting was done by the seminar management, the Czech teachers of German, the bilingual resource persons or by the students themselves, either sentence by sentence or in longer sections. Even though the preparation of the exhibition was hard work, especially during the second seminar, the results and the openings were ample reward for the great effort. The event in Regensburg was opened by the head of school, Mr Richard Sparrer, mayor Hans Schaidinger and the former regional director of the Oberpfalz, Dr Weidinger, who spoke words of welcome to the students. 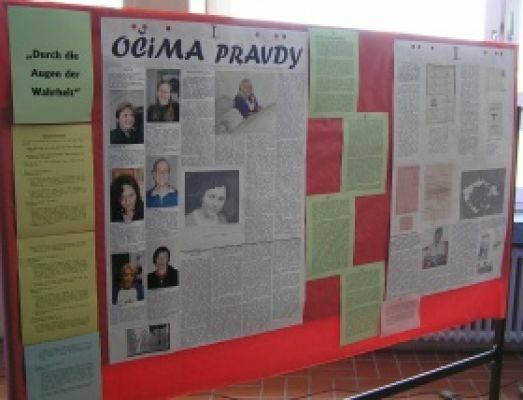 The course of the project and the interviews, which were presented in the form of huge newspaper title pages, were introduced by the students themselves. The audience was enthusiastic about the Czech tongue twisters in rap-form, the traditional music from the Chodenland (Chodenland – the region around Domažlice), the presentation of Czech customs, and of course about the commitment of the 20 students involved. During the break and after the official programme, there was time for a glass of champagne, original Chodish cake from Domažlice, discussions with the students and a walk around the exhibition. "It was really great!" was the enthusiastic comment of students and guests alike. The welcome speeches at the Domažlice opening were held by Mr Pavel Wolf, deputy mayor of Domažlice, Mr Kozina, deputy head of school of J.S.Baara High School, and Mr Reinhold Macho, mayor of the border town of Furth im Wald in Germany. 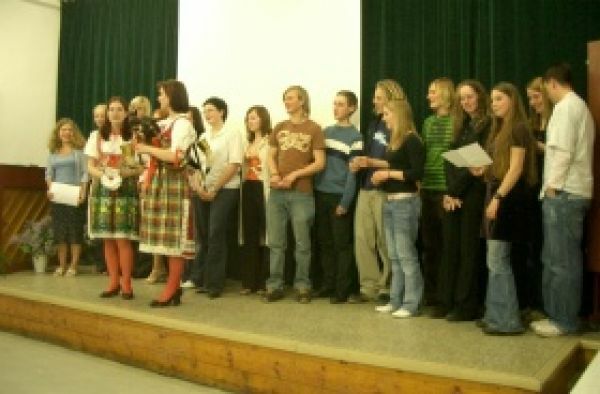 The entire programme of the opening was planned and organised by the students and teachers themselves (a musical trio, a short play about the Regensburg-Czech history, singing of the European hymn and the Domažlice song…). This initiative in particular shows how successful our project has been in promoting Czech-German co-operation. According to the written final evaluation of the seminar, the participants have broadened their knowledge of German-Czech history and learned a lot about the stereotypes persisting on both sides of the border. The participants learned many new things, even if one student stated that the Second World War had not been covered sufficiently. The participants also received a training in journalistic skills, namely how to conduct and evaluate interviews and how to design a newspaper. The questionnaires and the professionally produced project results are proof of this. The aim of cultural exchange and getting to know the respective other country was realised through visiting one another and living in guest families, but also through shared activities of the participants in the evenings. During the second seminar, when everybody worked together in a joint project, i.e. the exhibition, the friendships among the participants deepened. More visits are being planned. In any case, the interest in the other country was raised, and a more realistic view of the "others" was achieved, as is clearly shown by the questionnaires and statements. All participants are greatly interested in a continued co-operation. In the beginning of July, the Czech students came to Regensburg for a weekend on their own initiative, German teachers and students plan a canoe expedition in the Czech Republic and a joint theatre project is to start now. Negative stereotypes of "others" can only be revised and avoided through personal experience. The impression gained of each other during the seminar was positive throughout; there were no incidents at all of negative or hurtful remarks about other participants. We see that as a sign that the past of both countries is no longer determining the views of the younger generation. Another more practical, material goal was the production of an exhibition by the participants to inform the general public in the border region about the really existing images of the "other" across three generation, as they were established through the interviews. The students invested a lot of work and effort to present the results of their interviews on very professionally made newspaper title pages in A0-format. The project was extensively covered by the press (e.g. by the Süddeutsche Zeitung), which shows that a broad public took notice of the students' commitment. Recordings of the opening ceremony were broadcasted by the regional television station, which also contributed towards a general public awareness.